Left: v2.15. Center + Right: v2.16. The value of smartwatches will basically live and die by how well notifications are displayed, and perhaps just as importantly, how easily users can filter those notifications. 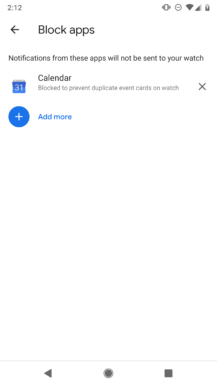 The latest update makes that situation a little more user-friendly with a revised screen for filtering the apps that get to send notifications to your watch. 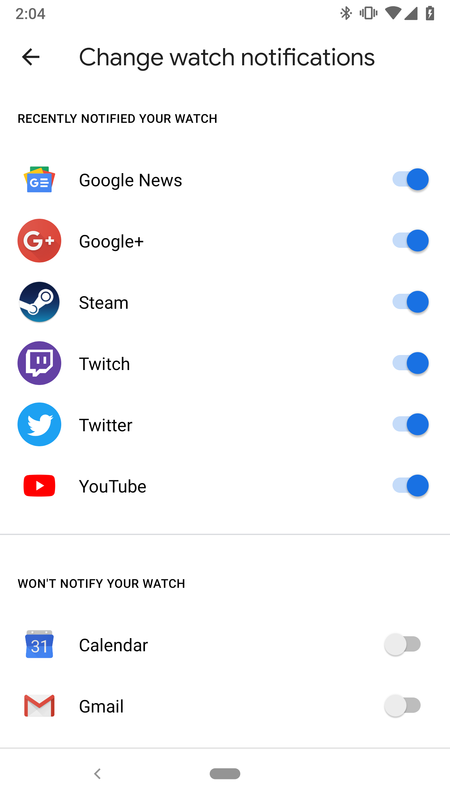 Version 2.16 now includes a list of the apps that recently sent notifications to your watch, making it easy to turn off any that are bothering you. Aside from that, the new layout isn't functionally different, but it's much more pleasant to use and browse. 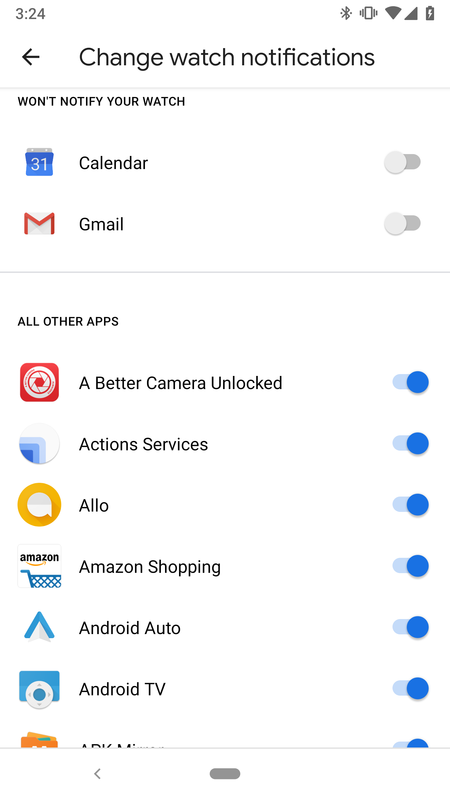 Instead of asking users to add items to the list one-by-one, there is simply a long list of the apps installed on your device, each with a toggle switch to its right for disabling apps before they can become a nuisance. While there were improvements to standard notification management, there's a whole separate level of detail that's about to see improvements: Contacts. Whether it's your family members, best friends, or your boss, there are some people that simply can't be ignored. A new feature is in the works that will allow users to put favorite contacts onto a list that will get higher priority than others. The nature of this one is still vague. I don't know yet if the list of favorites allows some contacts to get through when you've set notifications to silent, much like the do not disturb list allows some apps to get through, or if perhaps there are other techniques in play to add prominence to notifications coming from selected contacts. 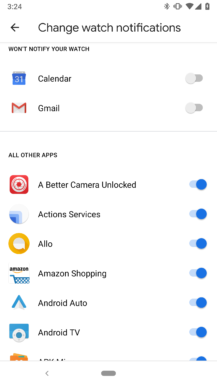 Unfortunately, for contact filtering to work, each app must be supported. It's not entirely clear if this means the apps have to conform to a specific format in notifications or use a specific API, or perhaps the Wear team will have to bake in custom support for individual apps. 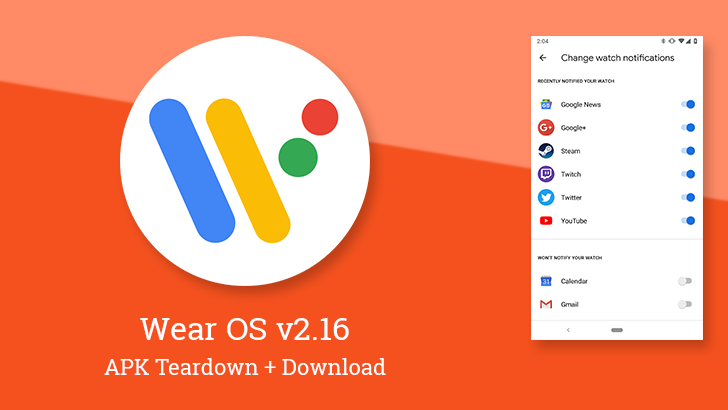 I assume we'll get more details about this when Google announces the official changelog for this Wear update. Ever since the introduction of Complications to Android Wear, there has been a complication that shows your watch's battery level. However, if you wanted to see your phone's battery level, you would need a third party application. 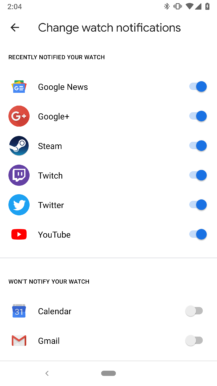 Google will be getting around to changing that situation soon enough, and we'll all get to see both our watch and phone battery levels on the small screen strapped to our wrists. 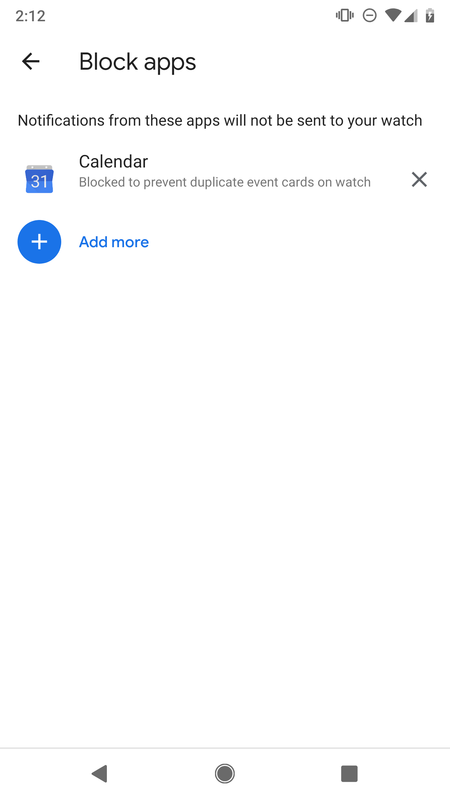 When music or other audio is playing on your phone, Wear inserts a card into your stream with playback controls ready to pause or skip as you like. Of course, if you don't like those controls, it might be pretty annoying that the card can't be dismissed. Sometime soon, that may not be the case, Google is making the controls optional. This isn't a simple case of making the media controls dismissable, they'll actually be entirely optional. Users will be able to change an autolaunch setting to prevent media controls from appearing. This is all pretty straightforward, but there is an interesting bonus detail. Two different messages explain how the controls can be turned back on. One of these instructs users to go to Settings -> General while the other mentions a "Media controls app." I haven't seen an app with a name like that yet, but maybe we should be expecting that too. Just last month, Google announced new and upcoming changes to Wear. The highlights were generally organized around health and fitness, but also included key details about some overall interface changes. Among those changes will be a revised quick settings panel with 6 buttons. I will come back to the quick settings in a moment, but I wanted to start with the battery saver modes that will be accessible from the shade. Battery saver turns off while your watch charges. Save your battery &amp; only show the time. To exit, press the power button twice. Only show the time. To exit, press &amp; hold the power button to restart your watch. Do not disturb – "Stop notifications from buzzing your wrist"
Find my phone – "Ring your phone so you can find it"
Pay with your watch – "Pay right from your wrist and speed through checkout"
Settings – "Quickly change settings"
Theater mode – "Turn off your screen"
Battery saver – "Extend your battery life"
Demo mode will also include a card featuring expected durations for commutes. Utilitarian commands: send a message, set a timer, set an alarm, etc. And the cute Assistant features like: roll a die, tell me a story, inspire me, tell me a joke, etc. I know many of these already appear on watches, and I think it's likely some of this might be here to better show off the demo mode discussed above, but there's so much here that I don't want to leave it without acknowledging the addition.